It's a special time of the year when the Uftring Auto Group dealerships in Peoria are all able to assemble in one place. We're sort of like the Justice League of car dealers. Our superpowers consist of finding and offering an array of fabulous cars at great prices, and when we get together good things happen. Right now we're all together in one location, the East Peoria Event Center, where we have over 600 used cars on the lot for your picking. Yeah, over 600 cars! It's a bit overwhelming at first, but you can never have too much of a good thing. Pre-owned cars from 12 franchises are there, including Chrysler, General Motors, Ford, and many imports like Nissan and Land Rover. It's likely that we have many if not most of your favorite makes and models. With over 600 choices, you are bound to find something you like. If you're looking to sell your car we can buy it! This relationship works both ways, and we love to have great pre-owned inventory. It might be hot outside and the deals on the cars may be scorching, but you can keep cool inside the event center and shop at the same time in the convenience of air conditioning. We have financing as low as 0.9% and 1.9% for 60 months. Going any lower than that is probably illegal, so we won't do it. We'll also have CEFCU personnel on site for your convenience. Make sure to check out our ad below for all of the details. Come out to the East Peoria Event Center and see all of the Uftring Auto Group cars for yourself. 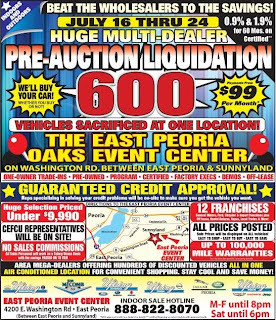 This is the best and biggest selection of used cars you'll find in the Peoria area, complete with great savings and super friendly staff. Hope to see you guys out there! The East Peoria Event Center is located at 4200 East Washington Street in East Peoria, Illinois.